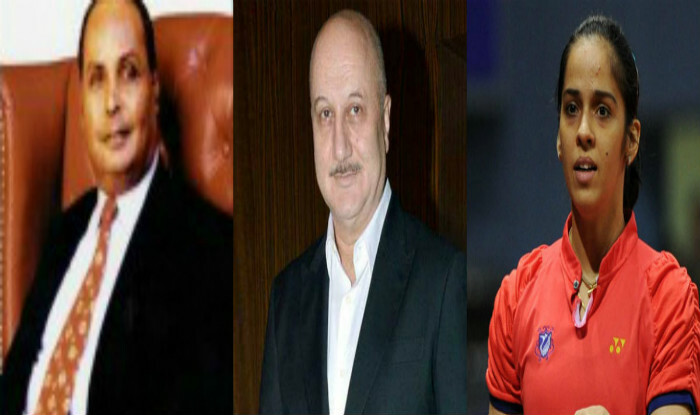 Dhirubhai Ambani, Anupam Kher & Saina Nehwal To Be Honoured with Padma Awards Today : he fortune of national award comes just only to few people’s faith and this year, Founder of Reliance Industries late Dhirubhai Ambani, former governor of Jammu and Kashmir Jagmohan, actors Anupam Kher and Ajay Devgn and badminton star Saina Nehwal are among 56 eminent persons who will be honoured with Padma awards by the President tomorrow. Padma Shri is the fourth highest civilian award of India, after the Bharat Ratna, the Padma Vibhushan and the Padma Bhushan. Awarded by the Government of India. Anyone dreams of getting a National Awards and this year this dream is going to come true to Art of Living founder Sri Sri Ravi Shankar, renowned dancer Yamini Krishnamurti, former CAG Vinod Rai, film maker Madhur Bhandarkar and celebrated chef Mohammed Imtiaz Qureshi will also receive the Padma awards at the Civil Investiture Ceremony to be held at Rashtrapati Bhavan.